Handyman repairing a set of french doors. A good handyman has experience in the many different construction trades. 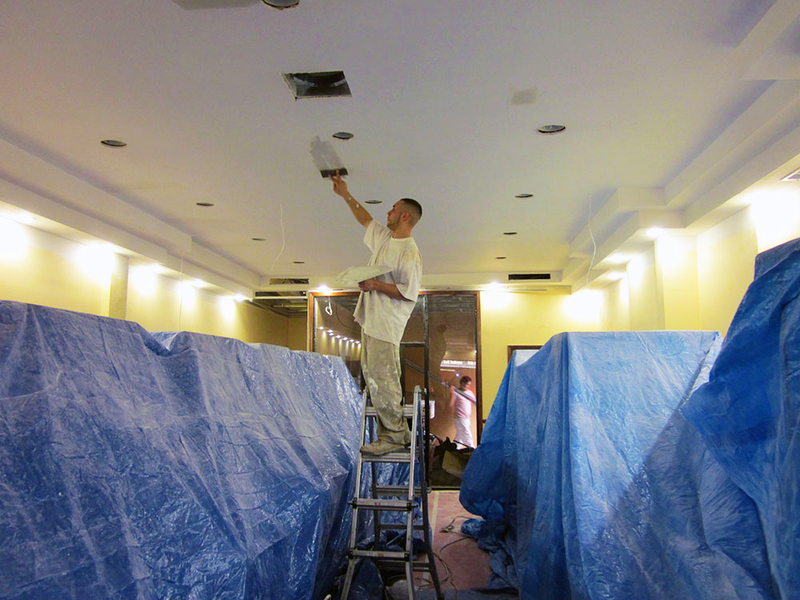 Skilled technicians have the experience that it takes to always complete your projects safely. Handymen should always pride themselves in always finishing their work on time and within your budget. In this image you can see a handyman repairing a door that was damaged by a dog. This home was in in Lake Magdalene and the homeowner said that over the years the family dog was constantly scratching at the door and sometimes even gnawing the trim at the bottom of the door with his teeth. In order to repair the door the handyman had to cut off the bottom section of the trim and match it up with an identical piece of molding. For the scratches he used a fast drying wood putty and lightly sanded it with a fine sand paper. Then we took the piece that was cut off to home depot and had them match the color of the paint .The end result turned out very well and his client was very happy. Handyman fills nail holes and paints. 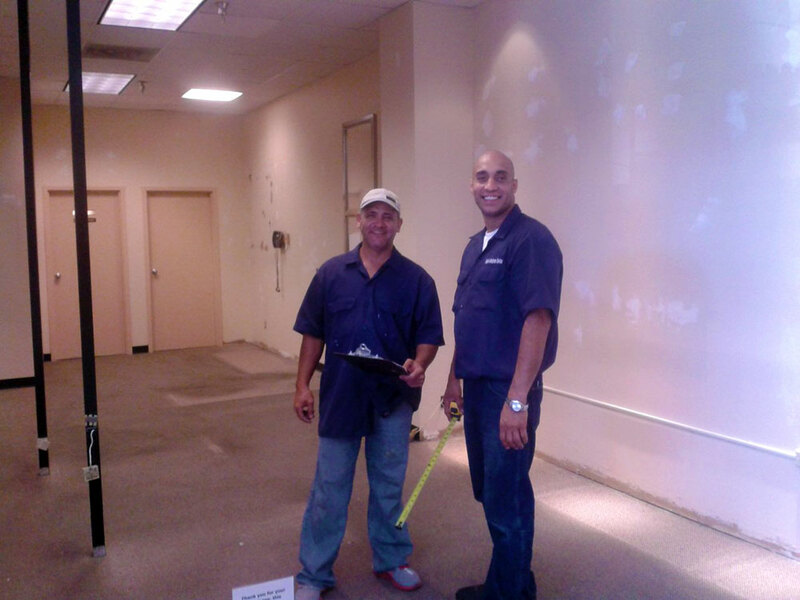 In this Picture you can see me Bobby the owner of Bobby’s Handyman Service on the right with Alfred on the left. They were relocating so we had to remove all the furniture and decorations from the walls and then have them shipped to the new Location. Then we had to repair all the walls that were full of nail holes from the decorations on the walls an then repaint. Although we had a deadline of three days the entire project took approximately two days. The manager was very grateful and once again we had a very happy client. Handyman pouring a concrete slab. 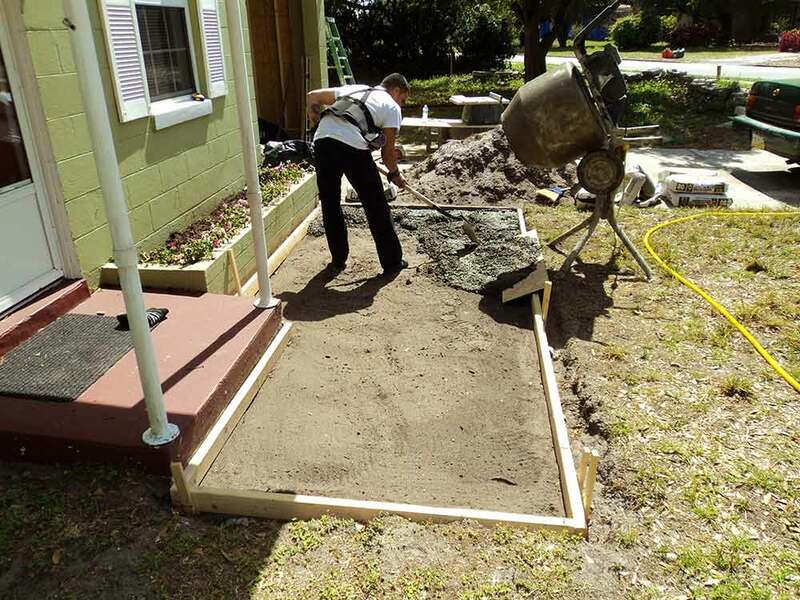 In this picture you can see Fred spreading the cement inside of a two by four form that we built to extend the walkway in front of the home . The home owner called us and explained to us that every time anyone would come in the house they would have to walk on the grass and ended up tracking the dirt inside the house. So to solve this problem we built a form for a walk way that extended from the front step all the way to the driveway creating a path for visitors to walk on. The owner was very happy with the job. A handyman is commonly considered to be a skilled professional problem solver and a Jack of all trades. 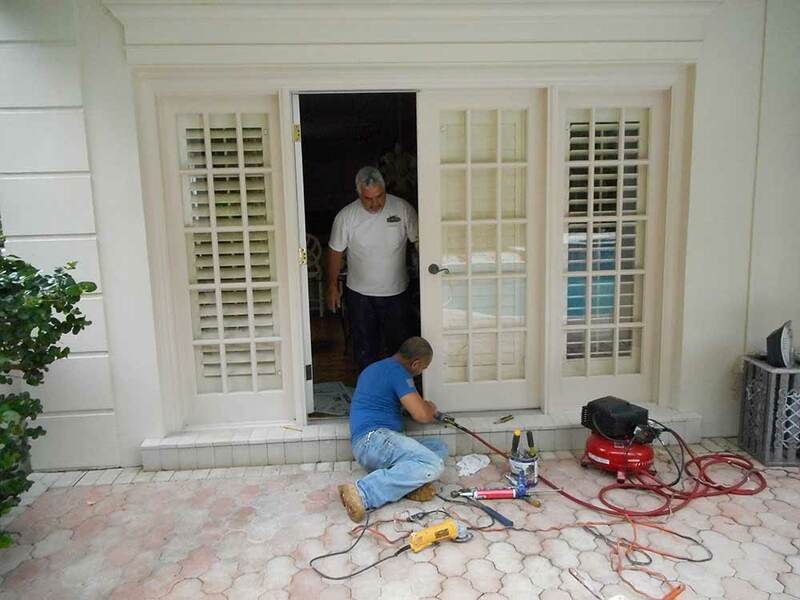 No matter what type of problems your having with your property, a good handyman will always be able to troubleshoot, diagnose and correct a problem as long as it does not require a license in the state of Florida. Another benefit of using a handyman is that you only need to call one company to fix many different types of problems. For example a good handyman can do many things such as assembling your furniture, power washing and painting or even cleaning your back yard. The convenience of just having to make one phone call to finish a long list of odds and ends throughout your property is one of the best selling points of a handyman.